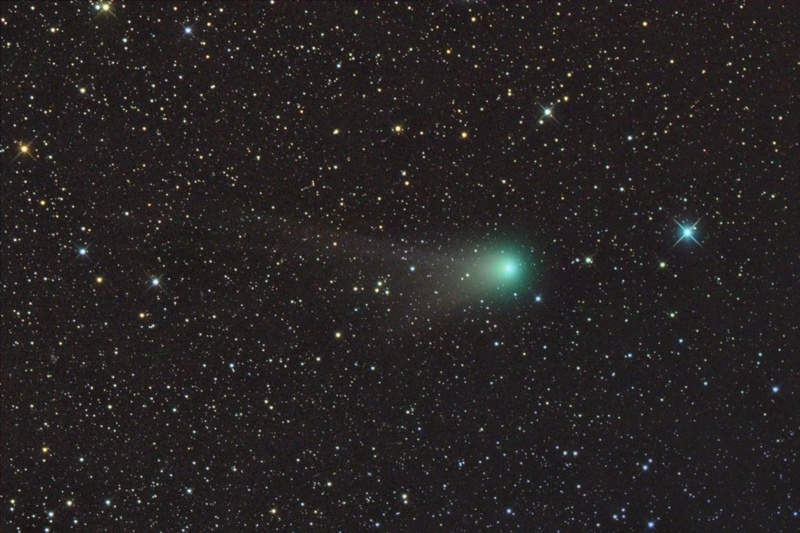 Explanation: A good target for binoculars and small telescopes, Comet Garradd (C/2009 P1) now shines in planet Earth's evening skies, a steady performer but just below naked-eye visibility. Telescopic images like this composite from October 15 can find the comet with a lovely green coma, sporting multiple tails, and lingering against a background of faint stars. The field of view spans over 1 degree or about 2 full moons within the southern boundaries of the constellation Hercules. Now around 16 light minutes (2 astronomical units) away, P1 Garradd is an intrinsically large comet, but will never make a very close approach to Earth or the Sun while sweeping through the inner solar system. As a result, the comet will likely stay a sight for telescopic eyes only, moving slowly through the sky and remaining in Hercules during the coming months.